(Minghui.org) Fun Guandu Festival, one of the biggest events in Taipei, Taiwan, took place in Guandu Nature Park on October 29, 2016. Falun Dafa practitioners participated with a waist drum team, heavenly girls, and other performances which drew applause from spectators. But across the Taiwan Strait, practitioners in Fujian Province and the rest of China have been facing severe suppression for practicing the same meditation. Falun Dafa practitioners attended in Fun Guandu Festival in Taipei on October 29, 2016. Heavenly girls group and waist drum team. Kuo Cingtran, head of Fudeli Village of Guandu, was excited to see the Falun Dafa practitioners, “They [practitioners] are always here helping us get healthier and happier. Their performance today is especially wonderful.” He said that Falun Dafa was a highlight of the event. Ruan Aiyin, 54, a woman who lives in the countryside of Ningde City, Fujian City, began practicing Falun Dafa in 1998, and her illnesses disappeared soon after. She has been arrested and detained four times for her belief. At the Fujian Women’s Labor Camp, officials forcibly performed surgery on her despite her good health. At the Ningde Detention Center, guards ordered inmates to drag her through a pile of trash and force-fed her with rotten garbage and plastic. After filing a criminal complaint against former Chinese leader Jiang Zemin for persecuting Falun Dafa, Ms. Ruan was arrested by officials on September 1 and sent to a mental hospital on September 30 for further persecution. Ms. Ruan’s experience is only one example of Falun Dafa practitioners being persecuted for their belief in Truthfulness-Compassion-Forbearance. According to reports received by the Minghui website, at least 839 incidents have occurred in which practitioners were targeted for their faith in September 2016 alone. (Minghui.org) After debuting in Japan, the Shen Yun Symphony Orchestra headed to Taiwan and kicked off a 12-city, 2-week tour in Taoyuan at the Zhongli Arts Hall on September 17, 2016. The orchestra played to a full house despite the tropical storm brought by typhoon Malakas. The concert concluded with thunderous applause and a lengthy standing ovation, with the performers taking nine bows during a curtain call. “It’s a great musical feast,” said Cheng Wen-tsan, Mayor of Taoyuan City, after attending the concert at the Zhongli Arts Hall on September 17. “The music is touching to people because the melodies have a strong affinity, and people are moved because of it,” said Ms. Mao Pei-rong, conductor for the Taoyuan Yueh-Yo Chinese Chamber Orchestra. “The music of Shen Yun has very deep philosophical meanings. This kind of music can be felt directly by the heart. It can touch and target one’s heart without much explanation,” said Chuang Hsiu-mei, the Director General of the Department of Cultural Affairs in Taoyuan. “This is the remedy for the 21st century,” she said of the traditional values that Shen Yun presents, such as being in harmony with nature. “I could feel the grand atmosphere and the beauty of blending Chinese and Western instruments,” said Li Shih-ying, President of the Science City Community University in Hsinchu. The Shen Yun Symphony Orchestra will continue their Taiwan tour with performances in Keelung on September 21, Yilan on September 22, Tainan on September 24, and Yunlin on September 26. For more information on tickets and dates, please visit ShenYun.com/symphony. (Minghui.org) The documentary Human Harvest, a Peabody Award winner , exposes the Chinese Communist Party’s (CCP) harvesting of organs from living Falun Gong practitioners imprisoned for their faith. The film premiered simultaneously at the Ambassador Theatre in Taipei and the MLD Cinema in Kaohsiung on July 9, 2016. The Taiwan Association for International Care of Organ Transplants (TAICOT) sponsored the screenings. Attendees expressed great concern and condemned the organ harvesting crime still taking place in China. Attorney Liu Silong calls for the public to pressure the CCP regarding its human rights violations. Attorney Liu Silong of Jen-Song United Law Firm said the documentary confirmed what he had heard previously about organ harvesting. He said the existence of the crime had been proven by the detailed analysis in the documentary and something the CCP cannot deny. “I hope it becomes a landmark in freeing mainland China from the darkness of totalitarianism,” he said. Liu called for everyone to act against the atrocity, spread the news, pressure the CCP to stop its human rights violations with powerful public opinion, and help stop the genocide. Professor Li Shujun of Kaohsiung Medical University said she was looking forward to bringing the documentary to her university and letting future doctors know about the CCP’s organ harvesting crimes. Having taught in mainland China for a year, Professor Li sees all people living in the totalitarian country as victims; by hiding information from the people, the regime can commit terrible crimes with impunity. She said the atrocity of organ harvesting cannot be tolerated and hopes it will be stopped as soon as possible with increasing pressure from the international community. (Minghui.org) Falun Gong practitioners in Taiwan held a series of activities in front of the National Sun Yat-sen Memorial Hall on May 1 to celebrate the upcoming 17th World Falun Dafa Day, May 13. The day also marks the 65th birthday of Master Li Hongzhi, the founder of Falun Dafa, also called Falun Gong. Hundreds of practitioners gathered for the peaceful exercises, after which there were various performances of traditional Chinese dance, instruments, and singing. A photo exhibition on the sides of the square in front of the memorial hall allowed the many passersby to learn about Falun Gong and its worldwide impact. Tourists from China watch and record the large scale Falun Gong event, something they can only see while traveling abroad due to the persecution of Falun Gong in China. Visitors viewing the Falun Gong photo exhibition. A practitioner plays the Erhu, a traditional Chinese instrument. Young practitioners perform traditional Chinese dance. The Divine Land Marching Band performs on the stage. Ms. Liao Weiyi dressed as a “celestial maiden” hands out hand-made lotus flowers to the tourists during the event. Dr. Chen Chunhao, a graduate of Taiwan University, works for an electronics company. He came to the celebration with his wife Wanchen, their two children, and his brother-in-law Li Jianhao. The whole family practices Falun Gong. Dr. Chen had always looked for the meaning of life since he was young. In his senior year at college, he saw a professor on TV sharing his experience of cultivating Falun Gong. Dr. Chen was curious, so he found a copy of Zhuan Falun (the main book of Falun Gong). Dr. Chen’s brother-in-law, Li Jianhao, had poor health since he was little. He was a frequent visitor of local hospitals. Mr. Li had joined all kinds of religious groups, looking for the goal of life. In 2002, he got a copy of Zhuan Falun from his mother. Mr. Li’s sister, Dr. Chen’s wife, Wanchen used to think that practicing Falun Gong was only for elderly people. 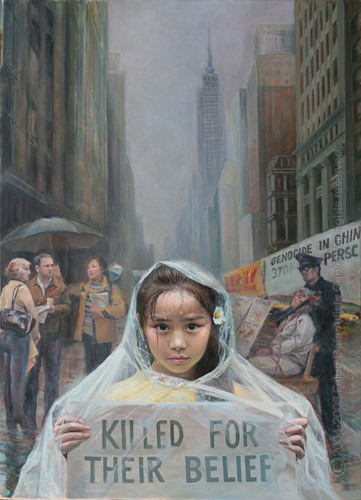 When her mother first told her about Falun Gong, she didn’t pay much attention to it. But the changes in her brother sparked her curiosity. Encouraged by Mr. Li, Wanchen joined the free Falun Gong workshop for college students, where she learned more about Falun Gong, and also started practicing. (Minghui.org) May 13 this year marks the 17th World Falun Dafa Day and the 24th anniversary of Falun Dafa’s public introduction in China, as well as the 65th birthday of its founder Mr Li Hongzhi. Over 1500 practitioners in southern Taiwan got together on May 1 to celebrate this special day. Together they formed large characters that said “513 Falun Dafa” and “Zhen-Shan-Ren,” meaning Truthfulness-Compassion-Forbearance, the central teaching of the practice. Falun Dafa practitioners in Taiwan celebrate World Falun Dafa Day. Practitioners in southern Taiwan form large characters and demonstrate the five Falun Dafa exercises. Ms. Huang Qinya recovered from cancer by practicing Falun Dafa. Ms. Huang Qinya used to have chest pain, which turned out to be cancer. Surgeries and chemotherapy didn’t help with the pain. A friend introduced her to Falun Dafa, and a few months into the practice her cancer was gone. Ms. Huang wanted to show her gratitude to Mr. Li and the practice by participating in this event. Mr. Huang Dengbao, a semi truck driver, narrowly escaped danger several times. Mr. Huang Dengbao drives a semi truck for a living. Because he had to stay awake for long periods of time, he became addicted to smoking and chewing caffeine-laden nuts. His health suffered as a result, but he had a hard time quitting the bad habits. Soon after he became a Falun Dafa practitioner in 2011, he easily quit smoking, drinking, and chewing the nuts. He is now leading a much healthier lifestyle. Many of his friends became practitioners after seeing his dramatic improvements. Mr. Huang also narrowly escaped danger several times. He once had a head-on with a tour bus on a highway. The front of his semi was crushed. The steering wheel broke off and fell on his legs and he was jammed inside the driver’s seat. He was not harmed, which surprised the police and the paramedics. Mr. Huang knew that he was somehow protected by divine powers. Ms. Ye Huiqing is a consultant for foreign students at a university. Because she follows the teachings of Falun Dafa, the students appreciate her. Ms. Ye Huiqing counsels foreign students at National Sun Yat-sen University and helps them when they are sick or have problems adjusting. It used to be a great challenge for her, because it requires a lot of physical strength as well as patience. One day a foreign student told her about Falun Dafa. A month into the practice she was no longer tired all the time and her breathing problem was gone. “I now have endless energy and patience, thanks to the practice,” said Ms. Ye. She is efficient at work and helpful to the students. Many foreign students still send her cards over the holidays years after they graduate. (Minghui.org) More than 1,000 Falun Gong practitioners participated in a large group exercise at Taipei City Hall Square on April 24, 2016. The event was organized by the Taiwan Falun Dafa Association to commemorate the April 25th peaceful protest in Beijing 17 years ago, and to call on the Chinese Communist Party (CCP) to end the suppression. Shortly after Falun Gong practitioners were illegally arrested in Tianjin, a major city near Beijing in April 1999, over 10,000 Falun Gong practitioners participated in a peaceful appeal in Beijing on April 25. Jiang Zemin, head of the CCP at the time, ordered a ban on Falun Gong in July. The ban was followed by nationwide arrests, detentions, and torture of innocent practitioners. Practitioners in many regions around the world have since been holding events every year to raise awareness of the severe human rights violations. Several city councilors from both Taipei and Kaohsiung, the two largest cities in Taiwan, attended the event at Taipei City Hall Square on April 24. Over 1,000 Falun Gong practitioners joined the group exercise in Taipei on April 24, 2016. Falun Gong practitioners are not the only victims of the totalitarian CCP regime. About 80 million Chinese died during the series of political campaigns launched by the Party in the past few decades. More than 230 million Chinese have renounced their memberships in the CCP and its affiliated organizations since the publication of the Nine Commentaries on the Communist Party in 2004. She said practitioners in Taiwan have joined efforts to end the persecution of Falun Gong in China and hold Jiang responsible for his crimes. “We must speak out for justice and we must stop the CCP’s brutality,” remarked Chang. Chen Lina, a member of the Kaohsiung City Council, traveled to Taipei to support the Falun Gong practitioners. From her observation, she found practitioners are nice people and they bring positive energy as well as hope to the society. Because of the positive changes Falun Gong has brought, “I would recommend Falun Gong to my friends,” she said. Looking back at the events of 17 years ago, Chen said it was a turning point in history. It takes efforts to do things that will benefit the entire society, but Falun Gong practitioners have been doing so, with determination and persistence. She believes this will lead to a better world and a brighter future for everyone. Taipei City Councilor Hung Chien-yi said he came here to help Chinese people gain freedom, human rights, and justice. “The Chinese communist regime is one of the few regimes that suppress people so badly.” He said this goes against the society, and he called on more people, including tourists from the mainland, to condemn Jiang’s directorship, and the harm he has caused to the people. Despite the ongoing persecution, Hung said the principles of Truthfulness-Compassion-Forbearance will prevail, and the suppression will come to an end. Chang Mao-nan, another Taipei City Councilor, praised Falun Gong practitioners for their persistence in freedom of belief. “What I do not understand is, what makes the CCP scared and what basis does it have to suppress Falun Gong?” He encouraged tourists from China to learn the facts about Falun Gong during their trip, and pass on the information after returning. Taipei City Councilor Chang Mao-nan said he believes Falun Gong will be freely practiced in mainland China in the future. Chang reiterated that Falun Gong practitioners are innocent and peaceful. It is Jiang and the CCP who act against people’s will, causing harm to Chinese people. He expects Falun Gong will once again be widely practiced in mainland China in the future. Both Hung and Chang hoped to initiate a resolution in the Taipei City Council to hold Jiang responsible for the severe human rights violations. Tsai said that on the day following April 25, 1999, more than 20 people went to a group exercise site near Tsai’s home to learn the exercises. Right now, there are hundreds of thousands of people practicing Falun Gong in Taiwan.